Why Use a Professional for Blood Cleanup? Blood stains are inevitable – they’re a part of life. They begin in the delivery room the moment we’re born, and they often accompany our deaths. Moms deal with skinned knees and cut fingers on a continual basis, and those childhood boo-boos keep bandage makers in business. But what about cleaning up when blood is present? Blood can be one of the most difficult stains to get out. But what we’re addressing in this article isn’t the routine blood stains you get at home; those you usually can safely deal with yourself. But there are times that blood should NOT be handled by anyone other than a trained professional, because your own health could be at stake. Situations include suicide, unattended death, or violent crime. 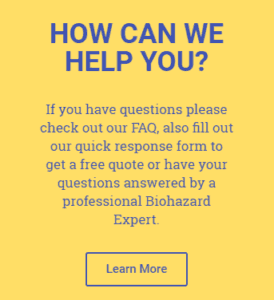 Yes, there is often a substantial amount of blood in these cases, but there are other reasons you should leave this type of cleanup to a company who specializes in dealing with biohazards and other types of specialized cleaning. Blood can carry disease or toxins you could not be aware of, even if it was from a close family member. There are many blood-borne pathogens you could be exposing yourself to without knowing it. The victim may have had a condition that even he or she didn’t know about. Once blood has dried, disturbing it will cause it to flake off, and it can become airborne. Inhaling those particles can be a health hazard as well. Most states and many local jurisdictions have protocols and regulations in place for dealing with blood clean-up from crime scenes, accidents, and trauma. Unless you are a trained and certified cleanup company, you most likely are not aware of what is required. When not done properly, a fine or other penalty could be the result. This is a bit more practical. 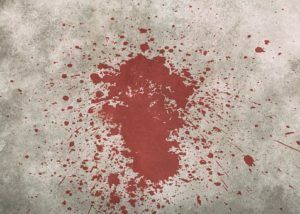 If you’re not used to cleaning up large amounts of blood – especially in carpeting or other fabrics – you could inadvertently make the stain worse. Bloodstains on carpet – other than small surface stains – often require removal and disposal of the carpet and possibly the underlying pad, because the carpet functions as a wick, drawing the blood below the surface of the carpet into the pad, and possibly into the floor itself. Any contaminants in the blood could be released in the future if the carpet becomes wet, such as in a future cleaning. So if you have property in the Pacific Northwest (or western Montana or Idaho) that has experienced a blood spill (other than a normal household accident), don’t expose yourself to hazards. Please call us. We have emergency response available, and each of our crews include a hazmat certified supervisor. We’ll get that blood cleaned up safely and properly. MedTech Cleaners has been providing haz-mat, biohazard, crime scene, and other trauma cleanup services in northern Oregon, Washington, western Montana and Idaho for nearly three decades. What Are the Most Common Bloodborne Pathogens? You got my attention when you pointed out that you can be exposed to blood-borne pathogens if you will clean blood on your own. A close friend of mine said that his living room is full of blood because of a homicide incident that happened to his house last night. He has kids to consider, so he’d like to make sure that cleaning it won’t cause him to get health issues. I’ll help him find a homicide cleanup specialist. Thanks! Thanks for your comments, Zia. We often handle cleanup after homicides, and your friend is wise to be concerned about health threats for him and his children. We definitely recommend you locate a local biohazard or crime scene cleanup specialist if you’re outside of our area. Thanks for pointing out how professional cleaners can get the stain of blood for a violent crime in an area easily. A brutal fight broke out on the local bar last night, and there is blood everywhere in the interior of the establishment. I would think that the owner should consider hiring the pros since having blood stains on your seatings isn’t really good for business. Blood can carry disease or toxins which is very harmful. The given information is really accurate, concise and helpful to understand why to use a professional for Blood Clean-up.